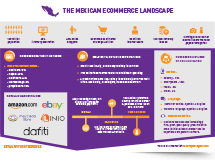 Mexico is one of the most promising ecommerce countries in Latin America. It has taken the lead in the ecommerce market, and today it is the second-largest market for ecommerce growth in the area. This fact sheet provides key insights into the opportunities of selling in Mexico and explores some of the preferences and expectations of local online shoppers.